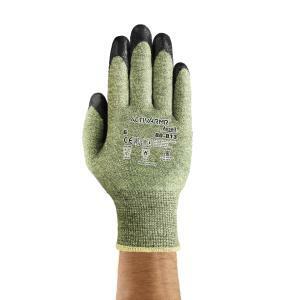 First glove to combine outstanding flame resistance, high cut protection and ergonomic design. Materials used in the glove are inherently flame resistant, even after washing. Arc Flash Hazard/Risk Category 2*: helps protect workers against arc flash hazards. Exclusive composite yarn provides exceptional cut resistance for safe handling of sharp objects and materials. Soft foam coating to ensure great flexibility and a secure grip in a variety of environments. Ergonomic design for superior comfort and reduced hand fatigue.